In November the Chinese gaming company gave back some of the ample gains it's enjoyed this year. 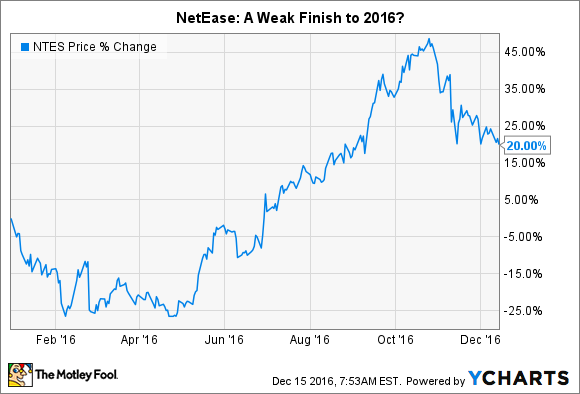 Shares of NetEase, Inc. (NASDAQ:NTES) fell 12.8% in November, according to data provided by S&P Global Market Intelligence. NetEase logo image: NetEase, Inc.
As is often the case with fast-growing emerging-tech companies, missed revenue expectations caused a sell-off in the NTES ticker after the earnings release. The company actually posted extremely fast top-line growth of 38.1% versus the prior-year quarter, but investors were expecting more, and profit-taking ensued. Regardless of shareholder reaction, each of the company's segments showed healthy expansion during the quarter. For example, the online game services segment, at roughly 71% of total revenue, grew by 26% over the comparable prior-year quarter. Several NetEase gaming titles found traction in Q4, including the company's latest 3D mobile offering, Onmyoji, which launched in September and quickly became one of the top-grossing games for iPad and iPhone in the China iOS store. While revenue growth remains extremely vigorous, gross profit margin slipped a bit during the last three months, from 67.6% in Q3 2015 to 65% this quarter. Executives cited the increasing role of mobile and licensed games in the company's online portfolio, which carry a lower profit margin than core online titles, for the profit drift. NetEase followed its earnings report five days later with the announcement of a $1 billion share repurchase program, which by board specification must be completed no later than 12 months from Nov. 15, 2016. If you glance at the chart above, you'll notice that if NetEase stock finishes the year where it currently trades, it will end 2016 with a roughly 20% gain. The organization has shown a remarkable facility with introducing successful gaming titles at a steady cadence over the last several quarters, and it's made a successful transition into mobile gaming. Thus, NetEase may experience further volatility in the near future, but it appears to have much potential for further expansion. It also happens to be throwing off prodigious cash flow along the way. Cash from operations in Q3 2016 alone totaled $559.3 million. Over the next 12 months, NetEase is set to generate enough cash to continue to self-fund its growth while paying for its authorized $1 billion share repurchase. The stock may be in a downtrend, but it's worth following in 2017.